Turn your iPod/iPhone/Apple TV into a translator. Is there a better alternative to iParrot Phrase? Is iParrot Phrase really the best app in Language category? Will iParrot Phrase work good on macOS 10.13.4? 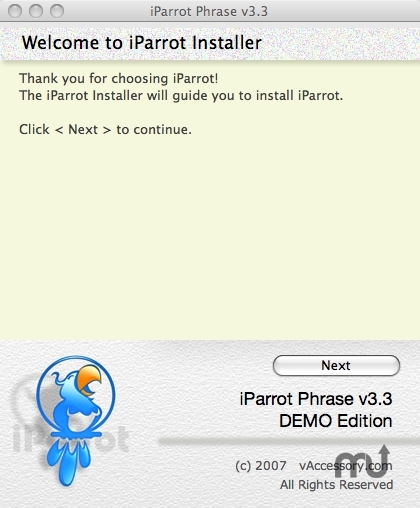 iParrot Phrase sets a new standard for instant multi-language translation software. Designed exclusively for the iPod/iPhone/Apple TV it's stocked with over 20 kinds of perfectly pronounced oral language for instant use. iParrot is organized into categories such as: Greetings, Transportation, Shopping, and Asking for helping etc. So it is enough for you to find the sentences you need instantly. Organized for instant access and ease, it is especially useful while traveling abroad. Virtual fluency available in Chinese, English, Japanese, Russian, French, German, Spanish, Italian, Korean, Portuguese, Thai and Vietnamese. do not support iPhone/iPod Touch/Apple TV any more.